Cheboygan MI is a major harbor along the northern Michigan coast of Lake Huron. Although a small city (pop. 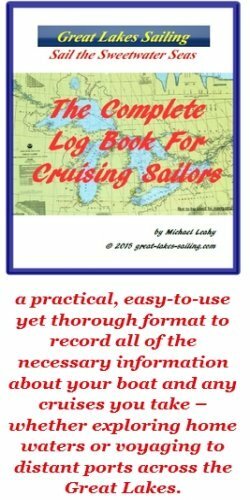 4,826), it offers all of the services and amenities that a cruising sailor could need. Originally a native settlement, Cheboygan's roots go back to 1844 with the establishment of a small settlement at the mouth of the Cheboygan River. Originally called Duncan, that name persists as the name of the bay immediately southeast of the river mouth. As the lumbering industry spread north, Cheboygan grew, in part due to its well-protected harbor. It enjoyed the boom times that the lumbering industry brought. As lumbering declined, Cheboygan turned to a small manufacturing base and, even prior to WWI, began promoting itself as a tourist destination. Tourism has been a major element of the local economy for over a century now. The approaches to Cheboygan MI are clear from all directions. The channel is well marked. Coming from the east, stay north of Fourteen Ft Shoal Light, an OC WHITE light visible 13 mi/11.2 nm offshore in good weather. To the northwest of this light is a GREEN marker buoy - "C3". Leave this on your port as you turn to Cheboygan. Approximately 1.25 nm on a course of 212.5°T will bring you to "R2" a Q RED light marking the beginning of the entrance channel. Follow the channel for .8 nm to the Cheboygan County Marina which will be on your starboard. You can also proceed up the river to the municipal docks. Be aware of submerged pilings on the port side of the channel after you enter the harbor. These are charted and you would be best off to hold a course to the starboard side of the channel. There is a bascule bridge with a charted vertical height of 9 ft/2.76 m. During the sailing season, the bridge opens on the 1/4 and 3/4 hour mark from 0700 to 1800, Monday to Friday. Weekends, it opens at the same times from 1100 to 1700. Outside these times, it will open upon request. The signal is 1 long and 1 short blast of the horn. You can also contact the Bridgemaster on VHF 16. Cheboygan MI lies at the entrance to a 40 mi/64 km inland water route. This is a delightful route to cruise, especially in the autumn when the colours are out. However, be aware that there are two fixed bridges, the lowest with a height of 9 ft/2.76 m AND an average depth of 5 ft/1.54 m. If you are in a sailboat, this may not be an option for you. However, area marinas do rent power vessels suitable for the waterway. The route winds along the Cheboygan, Indian and Crooked riivers, passing through Mullet, Burt and Crooked lakes. There is a strictly-enforced no wake rule for the entire route. There are several locks to navigate and vessel traffic can be heavy, especially on weekends. The rewards for those who navigate the waterway are beautiful scenery, wildlife and a whole new experience after sailing the immense lake Huron. There are lots of facilities in the picturesque villages along the route. This marina is located immediately inside the river mouth on the west side of the channel, your starboard as you enter. It has approximately 3 dozen slips for transient sailors. There is a fuel dock (diesel and gasoline) and a pumpout station. Water and power are available at the slips. There are restrooms, showers and laundry facilities. The grounds have picnic areas and BBQ grills. Welstrom Marina is located upriver, just before the bascule bridge, on the west side of the river. They have 40 slips with about a dozen set aside for transient sailors. There is no fuel dock but there is a pumpout station. There is water and power to each slip. This is a full-service marina and they are able to carry out a wide range of maintenance and repairs to engines, mechanical and electrical systems and hull repairs. There are restrooms, showers and laundry facilities. There is a ship's store. The minicipal docks are located upriver, just past the bascule bridge on the west side of the river. There are about a dozen transient spaces available. There is no fuel dock nor a pumpout station. There is water and power available at dockside. Restrooms and showers are also available. The grounds along the docks have picnic areas and BBQ grills. A major draw of these docks is their location - right in the center of the downtown. If you proceed up the Inland Waterway, you will come to the Anchor In Marina on the upper Cheboygan River, just before entering Mullet Lake. As a caution, the Lincoln Ave. fixed bridge (Clearance: 9 ft/2.76 m) is downstream of this marina, ruling it out for sailboats. They have transient docking for about a dozen boats. There is a fuel dock (gasoline only) and a pumpout station. There is water and power available to all slips. This is a full-service marina capable of carrying out a full range of engine, mechanical and fiberglass repairs. They also have a travel lift. There are restrooms, showers and laundry facilities as well as a ship's store. Duncan Bay lies to the southeast of the Cheboygan River mouth. There is good protection from all directions except the north/northwest. On the east side of the bay, on Cheboygan Point, is Cheboygan State Park with its beaches and miles of walking trails. Welstrom Marina is a full-service marina (see above). There is an IGA Supermarket located downtown. PNC Bank is located downtown and is likely the closest to the County Marina or City Docks. Cheboygan Memorial Hospital (231) 627-5601 is located in the downtown. Modern Pharmacy (231-627-9949, located downtown, is the closest to the municipal docks. Mulligan's is a popular roadhouse-style restaurant/pub. Close to the City Docks, it serves a variety of ribs, burgers and pastas with a good selection of Michigan-brewed beers. The Boathouse is also located close to the City Docks. Casual food in a relaxed setting. Hack-Ma-Tack Inn is located where the Cheboygan River flows out of Mullet Lake, about 6 mi/ 10 km from the City Docks. It is worth the ride there. It has an outstanding menu and beautiful grounds along the Cheboygan River including a large outdoor deck. Cheboygan MI is a magnet for boaters. In addition to easy access to the Mackinac Straits and the Inland Waterway, there is great fishing in local waters and extensive trails to explore. Cheboygan MI is home port for USCG Mackinac. She is the US Coast Guard's heavy ice breaker for the Great Lakes, When she is in port, tours can be arranged by calling the USCG base. Downtown, the historic Opera House, built in 1877, is a year-round venue for a wide variety of performing arts. Mid-July sees the Waterway Festival, a celebration of Cheboygan's rivertown roots. The Wanigan Race which takes place during the Festival commemorates the logging races and heritage of Cheboygan's history as a logging capital. Music Fest is a 2-day music festival that takes over downtown Cheboygan MI at the end of July every summer. There is also the Cheboygan MI tourism site that will give you more ideas on getting the most of your visit.